Android: Apk files are now signed using the new APK Signature Scheme v2. 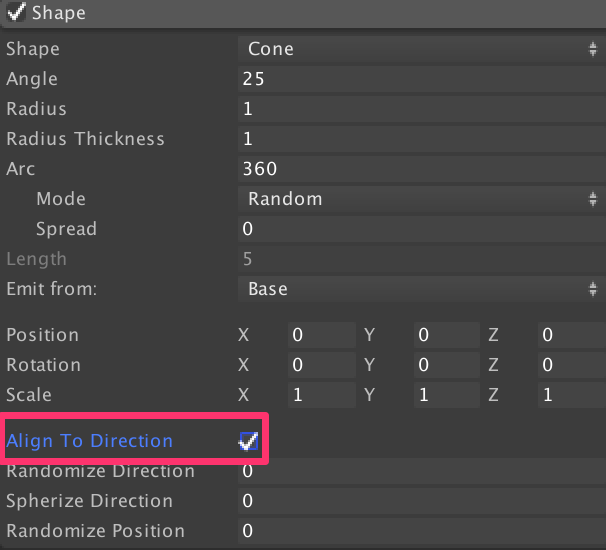 Asset Import: Added the option of computing weighted normals when importing FBX files. Fixed normal generation for hard edges. Asset Import: Support Segment Scale Compensate for models exported from Maya. Asset Pipeline: In batchmode the FailedAssetImports.txt file is now ignored because there's no way to cancel or notify the user when the asset importer fails. Build Pipeline: Scripts-only build is now available on all platforms. Build Pipeline: Unified assembly stripping code used for IL2CPP and Mono builds - which should result in more consistent behaviour between IL2CPP and Mono and in smaller build sizes for platforms supporting assembly stripping on Mono. 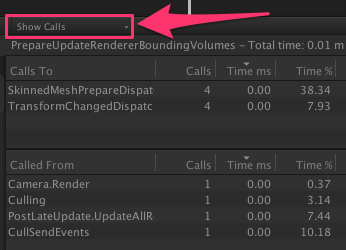 Editor: Added "Called From" and "Calls To" view to the Hiverarchy View of Profiler Window. 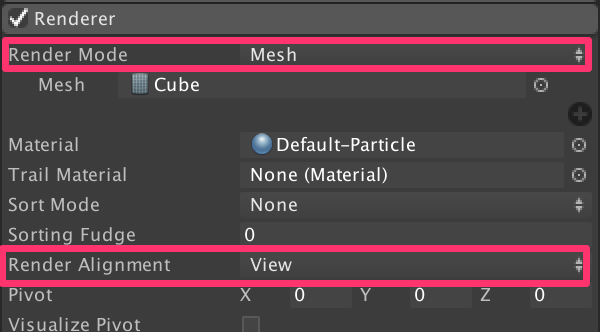 Editor: Added a pre-drop style to particle system Object fields so it highlights if something can be dropped. Editor: Added callbacks for assembly reload events: two events are dispatched: one before and one after reloading all assemblies. See: class AssemblyReloadEvents. Editor: DX12 Editor is more responsive and little bit faster. Editor: Log messages from connected players will now show in Editor console for easier debugging. Editor: MacOS: Support Visual Studio for Mac as an External Script Editor. Opens .sln (solution) file when double clicking a script. Editor: Scripts willl be opened correctly in JetBrains Rider when selecting it as external script editor. Graphics: Added a batch break cause (material disables instancing) to Frame Debugger. Graphics: Added a new surface shader option "dithercrossfade", generating the screen-door dithering effect code automatically for being used in LOD cross-fade mode. Graphics: Added memoryless mode to RenderTexture, accessed through new property RenderTexture.memorylessMode. Graphics: Added Mirror and MirrorOnce texture wrapping modes, in addition to existing Repeat and Clamp ones. Graphics: Frame Debugger is now capable of showing array shader properties. Graphics: Optimized conversions between float32 and float16 image formats on Editor for a x2 to x4 performance improvement. Graphics: Texture wrapping modes can be set separately on each U,V,W axis. Graphics: The default names for Graphics Quality Levels have been changed to be a little clearer, and more in line with what is common across other games. This will only affect newly created projects; existing projects will have the same Quality Level names as before (though, as always, you can edit the names via Edit -> Project Settings -> Quality). IL2CPP: Improved IL2CPP code conversion time on OSX. Conversion times may improve by as much as 2x. iOS: Added support for Watch apps and Watch app extensions in the Xcode extension API. Mobile: Added TouchScreenKeyboardType.Social and TouchScreenKeyboardType.Search for iOS/tvOS, Android, WindowsPhone and Tizen platforms. OSX: Added support for loading the first scene asynchronously when showing the splash screen. OSX: Metal: [MTLDevice recommendedMaxWorkingSetSize] is now used to query VRAM size when available. Particles: Added edit modes for Particle system collision mode planes. Particles: Edge emission is now more flexible, allowing you to choose the thickness of the edge used for generating particles. 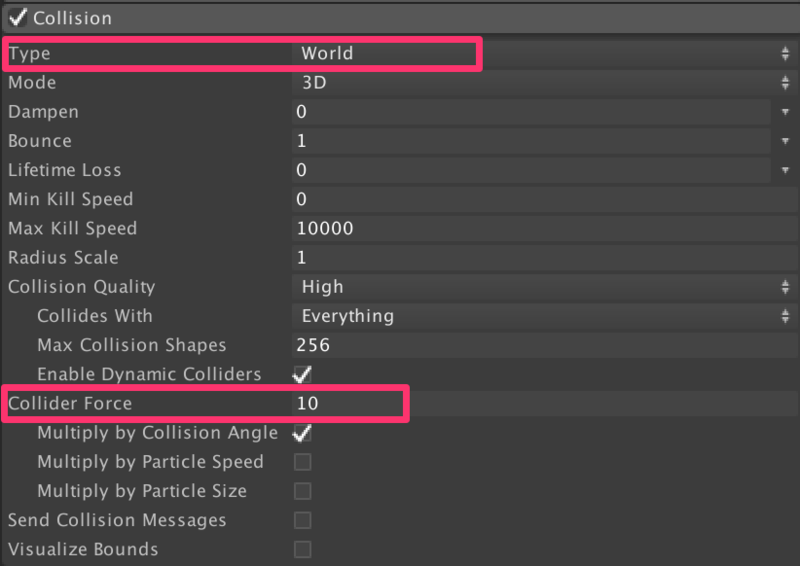 Particles: Improved particle system culling mode supported tooltip messages. These now contain more details on why the culling mode is unsupported. Particles: It is now possible to animate both the min and max constants, when using Random Between 2 Constants mode. Particles: Play Particle Systems when your game is paused, by choosing to use either Scaled or Unscaled time for the simulation. Particles: Randomize the spawn positions of particles, with a new option in the Shape Module. Particles: Scene lighting can now affect Lines and Trails. Particles: The Shape Module now contains an additional Transform, for applying custom transformations to the emitter shape. 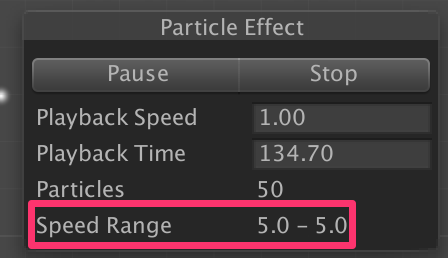 Particles: The speed range of a Particle System is now displayed in the Scene View GUI, when previewing a Particle System. Physics: Add ability to manully simulate 2D physics using "Physics2D.Simulate(time)" and turn auto simulation on/off with "Physics2D.autoSimulation=true/false". Physics: Expose Physics.Simulate and Physics.autoSimulation. This allows stepping the physics simulation manually, from scripts. Useful for customising the server-side physics, in-editor simulation, and more. Physics: When setting 'Rigidbody2D.simulated' to false, Editor inspector shows information about its effect. Shaders: Optimized game data build time for shaders with massive ("millions or billions") potential variant counts. 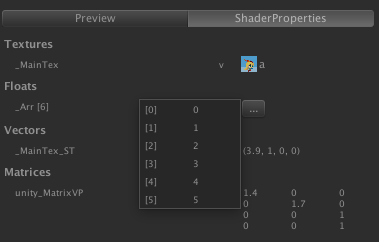 Fixed shader inspector popup menu to display variant counts larger than 2 billion properly. Shaders: SystemInfo.graphicsShaderLevel now reports more accurate shader models that better match shader #pragma target levels (now can report values 25, 35, 45, 46). Shadows: Improved shadow culling for stable fit directional shadows. Shadows: Improved shadow filtering for directional and spot lights. Universal Windows Platform: Unity player binaries are now signed. Web: (Also mentioned under API Changes) UnityWebRequest now has built-in support for downloading MovieTexture on platforms that do support it. A new helper class WebRequestMultimedia has been introduced for simple download of MovieTexture or AudioClip. WebRequest.GetAudioClip() has been deprecated in favor of WebRequestMultimedia.GetAudioClip().